This article is about the status ailment in the Mario & Luigi and Super Smash Bros series of games. For the move that can be performed in Super Mario 64 that is also called "trip", see Sweep Kick. Trip is a gameplay mechanic found in various Mario and related games. In the Mario & Luigi games, it is a status effect. Some enemies can make Mario and Luigi trip. If a Mario Bro. trips, they will make a noise and they will flail until it is their turn, or if the enemy attacks either tripped bro, meaning that the tripped bro cannot dodge or counterattack either. This status effect also prevents the player from fleeing and using Bros. attacks unless the tripped brother has high enough speed to move first. This status effect cannot be cured with a Refreshing Herb in the first two Mario and Luigi games. In Mario & Luigi: Superstar Saga, if an enemy hits the rear brother, the brother will begin the battle with this condition, although if the brother is fast enough, the condition is instantly negated. Since Mario and Luigi cannot switch in the subsequent games (Luigi is always in the back meaning he's more likely to get the status effect), enemies make Mario or Luigi trip if they hit him in the rear. In Mario & Luigi: Dream Team, the Gold Beanie will trip if the attacks are countered correctly. Unlike the past three Mario & Luigi games, the status was given the word TRIP, making it a normal status effect. This also happens in Mario & Luigi: Paper Jam and Mario & Luigi: Superstar Saga + Bowser's Minions. 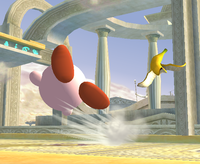 In Super Smash Bros. Brawl, there is a random chance that players can trip if they attempt to initiate a ground-based move such as ground attacks or running. Once players trip, they can get up normally, by rolling, or with a weak attack. Banana peels and Tingle (spawned with an Assist Trophy) can induce tripping, however, and some moves have a random chance to trip the player. Random tripping is removed in the next Super Smash Bros. game, Super Smash Bros. for Nintendo 3DS / Wii U, but can be caused by some items and Assist Trophies. This page was last edited on August 15, 2018, at 09:04.